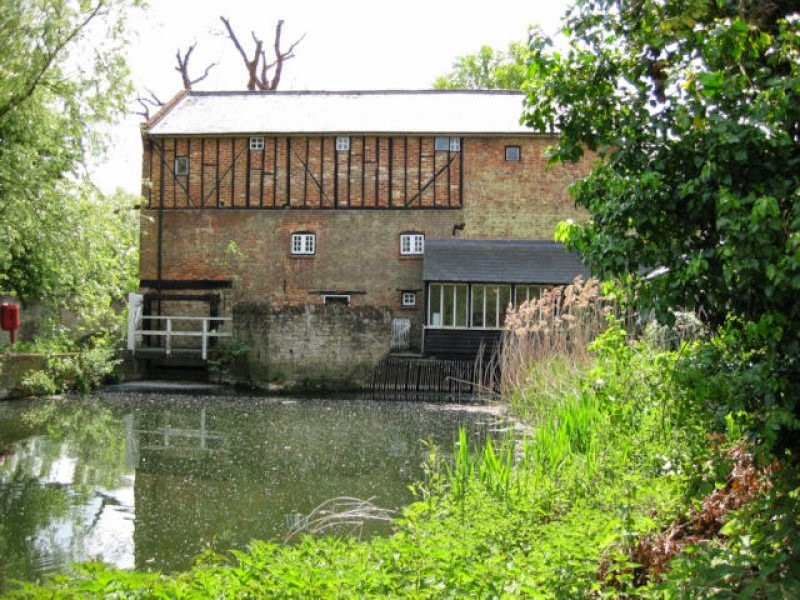 Bromham Mill, situated on the River Great Ouse three miles west of Bedford, just off the A428, and the eighteenth-century post mill at Stevington, are the two most iconic and important industrial heritage landmark sites in north Bedfordshire. Both were saved for posterity by the former Bedfordshire County Council and are now in the care of Bedford Borough Council. Thanks to fundraising by the Friends of Bromham Mill, a new set of historical interpretation boards have been installed around the watermill’s interior. 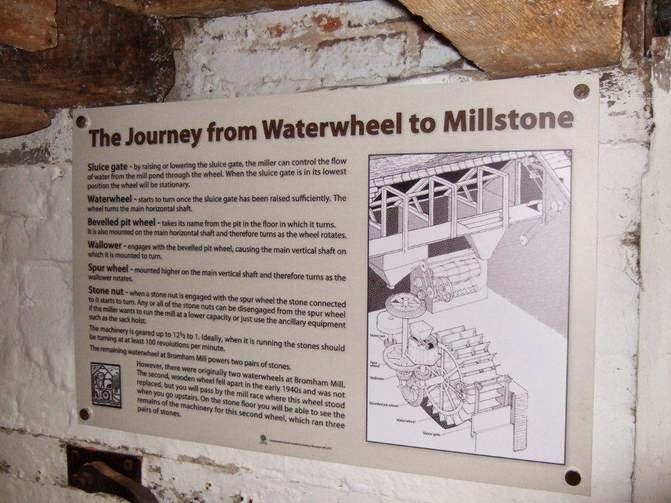 These well-illustrated and informative panels guide visitors around the site, explaining its history and how the mill worked when it operated commercially up to 1971. 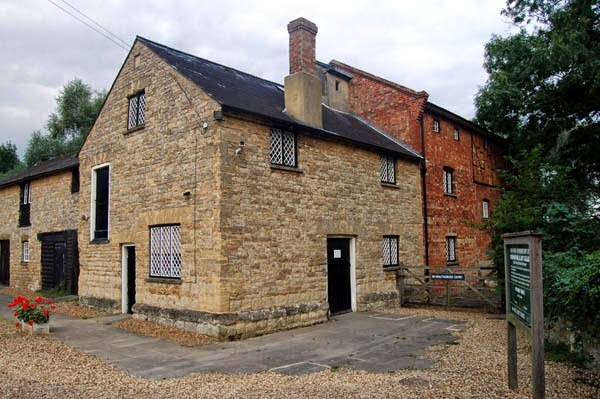 Milling has taken place at Bromham since Saxon times, as recorded in the Domesday Book of 1086. The present buildings date from the late eighteenth and mid-nineteenth centuries but based on seventeenth century foundations. They contain milling machinery and a waterwheel in working order. The last commercial operation was under the Quenby family, from 1905, by which time – thanks to the development of more efficient, industrially-powered roller mills throughout the country – milling, using water power was restricted to the production of animal feeds. The mill is open to the public, free, each weekend from April to the end of October on Saturday and Sundays, plus Bank Holiday Mondays, 10am to 4pm, and is served by the Mill Café offering fresh coffee, cakes, light lunches and afternoon teas. Situated as it is next to a delightful meadow, ideal for picnics, and also an island nature reserve, the Mill is well worth a visit. There is a changing programme of art and craft exhibitions and workshops as well as children’s events. There are a range of walks and cycle routes in the area, including a circular walk taking in the unique Stevington Windmill just a few miles away. 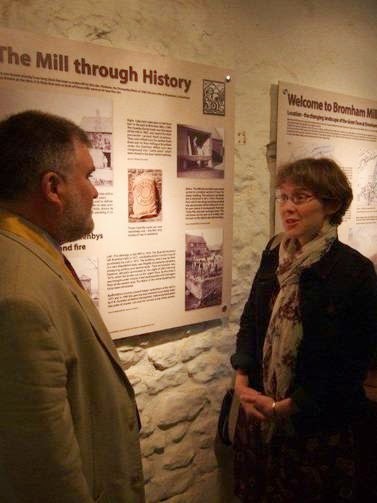 The interpretation boards have been developed by Amanda Keen, of the Friends of Bromham Mill (seen on the right with Dave Hodgson, Mayor of Bedford, at the mill's re-opening in April 2014), with technical and historical advice, respectively, by Adrian Fett and Stuart Antrobus. In addition, prospective visitors with smartphones can download 10 audio files, prior to their visit, which will provide an audio tour around the mill. For more on the history of Bromham Mill and other mills in Bedfordshire, see the illustrated book: Hugh Howes The Windmills and Watermills of Bedfordshire – past, present and future (Book Castle Publishing, 2009), or a brief history online from Bedfordshire and Luton Archives and Records Service.